The ship’s purpose is to stay on the edges of a fleet, quickly moving to key points to provide fire wherever necessary. Its speed means it can avoid being boarded by soldiers from heavier, more powerful ships while harassing them with arrows. The crew of this vessel is not expected to launch boarding attacks, only soften up a target for other friendly ships. They also have the ability to fire flaming arrows for a short period of time, which are much more devastating than standard arrows. Ironically, the archers are also vulnerable to missile fire as the upper deck of the ship has no protection. 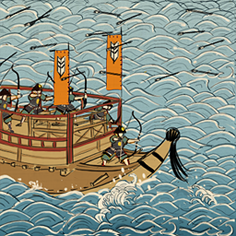 During the Sengoku Jidai, ships were mostly made from wood, occasionally augmented by thick bamboo or iron plates. This made them inflammable, and it was quite common to set fire to a vessel prior to boarding it. Archers would use fire arrows, or bombs would be thrown, all in the interests of making life as difficult as possible for the defenders. However, boarding actions were the most important tactic of war at sea, and everything else was subordinated to them. This was just as well, as incendiary weapons lacked the power of cannons, which were hardly common. Japanese naval warfare never went the same way as European naval tactics, with ships becoming gun platforms and fighting at a distance for the most part. Small crew who are mostly missile troops. Crew very exposed to missiles.